Primary sources are the lifeblood of history. Historians today rarely speak of history as a set of facts, but rather as a set of interpretations based on evidence from primary sources. Arguments about what interpretation is correct are as vehement today as they have always been, and decisions about what interpretation to emphasize in a textbook or include in content standards are often highly politicized. But once those interpretations have been adopted, printed, and handed to a student, he or she will usually accept them as “fact.” After all, it was written in the textbook, right? My teacher said so! The purpose of the Blueprint project is not to select or disseminate the proper interpretations of American and world history. The debates about different historical interpretations are important, but this is not their place. The Blueprint project is not about revising history, or those standards mandated by the state. It is about teaching those standards to students in a way that the students will remember. My hope is that both all of us can unite around the idea that history education is important and needs to be moved from the margins back into its rightful place in the core curriculum. At the California History-Social Science Project, we align everything we do with the California History-Social Science content standards. Those standards will be the starting place for the Blueprint, but ultimately Blueprint will be useful nation-wide. What I would really like to revise is students’ idea that history is a bunch of facts already written down by the textbook’s author or uttered from their teachers’ lips. I want my students to think of history as a collection of primary sources and interpretations based on those sources. I want them to act like historians, to examine primary sources and form their own interpretations. This approach makes history more interesting and more memorable. “Anu and Bel called by name me, Hammurabi, the exalted prince, who feared God, to bring about the rule of righteousness in the land, to destroy the wicked and the evil-doers; so that the strong should not harm the weak; so that I should rule over the black-headed people like Shamash, and enlighten the land, to further the well-being of mankind. . . .
53: If any one is too lazy to keep his dam in proper condition, and does not so keep it; if then the dam break and all the fields are flooded, then shall he in whose dam the break occurred be sold for money, and the money shall replace the [grain] which he has caused to be ruined. 54: If he is not able to replace the [grain], then he and his possessions shall be divided among the farmers whose corn he has flooded…. 195: If a son strikes his father, his hands shall be cut off. 196: If a noble-man puts out the eye of another noble-man, his eye shall be put out. If the teacher asks the question: “Did Hammurabi’s Code give equal justice?”, students would be able to answer from either source. However, in answering from the secondary source, the students would be reading or recalling a sentence they might or might not understand. To answer the question from the primary source, students have to read, think, evaluate and interpret. Which teaches them more? Which are they more likely to remember? Of course, the primary source is much less accessible to students, and teachers have to guide them through interpretation. That’s why Blueprint focuses on teaching the historical thinking skills and academic literacy support students need to work with primary sources. In reality, textbooks and other secondary sources are also necessary, and often the best teaching strategy is to use primary sources and the textbook to teach students history. Code of Hammurabi replica stele on display at the Rosicrucian Egyptian Museum in San Jose, California. The original stele, over six feet high, was found in Iraq in 1902. It is now in the Louvre Museum in Paris. The seated figure is Shamash, the sun god and overseer of justice for Babylon. 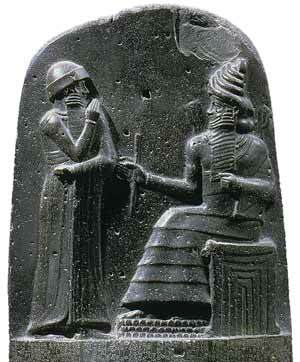 The standing figure is Hammurabi, who is presenting the code of laws to Shamash. The photos are courtesy of commons.wikipedia.org. inside “Using Primary Sources | Blueprint for History Education” melianband. com . I am grateful for pretty much all the tips.